A small business on the second floor of the Belfast Post Office has been temporarily shuttered after an ornate safe being moved Wednesday slipped, damaging the Belfast Post Office ceiling and blocking the stairs to the second floor. 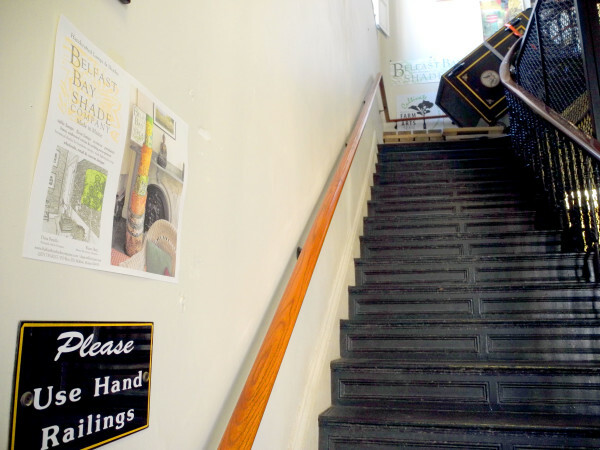 BELFAST, Maine — A section of the U.S. Post Office lobby has been temporarily closed off and a small business has been shut down after a heavy safe being removed from the second floor of the building slipped Wednesday and caused damage to the lobby ceiling. Post office customers craned their necks Thursday afternoon to look past the caution tape to the ornate safe that completely blocked the stairway to the second floor of the building, which is owned by the U.S. Postal Service. The safe apparently came from the old U.S. Customs House, which was located on the second floor of the building when it was constructed in 1857. A newer occupant is the Belfast Bay Shade Company, where artist and designer Dina Petrillo creates hand-printed botanical fabric, lampshades and artisan lighting with her husband, electrician Ryan Herz, and another employee. Petrillo and her employee were trapped upstairs Wednesday afternoon when the safe slipped. They left the building by a window and waited on the roof for a truck from the Belfast Fire Department to arrive and get them down to the ground. Petrillo said she spent the day on Thursday calling customers and canceling appointments. She said that while Belfast Postmaster Dave Cook has been extremely helpful in terms of trying to deal with the situation, so far it is unclear when Petrillo and Herz can access their company again. Postal customers, while they won’t be able to access 700 post office boxes in the lobby for the time being, will be able to get their mail. Structural engineers have been on site and deemed the facility safe, but part of the lobby will be closed off while contractors work above it to make repairs, according to a press release issued Thursday afternoon by Steve Doherty of corporate communications for the U.S. Postal Service’s northeast area. No timetable was given for when the lobby at the 1 Franklin St. facility would be reopened. Mail delivery to street addresses won’t be affected, according to Doherty. He said customers should bring some identification to pick up their mail at the retail window, which is open 6 a.m. to 5:30 p.m. Monday through Friday, and 6 a.m. to 4:20 p.m. Saturday. “We will work with our customers to minimize inconvenience while the necessary repairs are underway,” Cook said in the release. Customers with questions about their mail service can call toll-free 1-800-275-8777 or send an email by following the prompts on the Contact Us page at USPS.com.